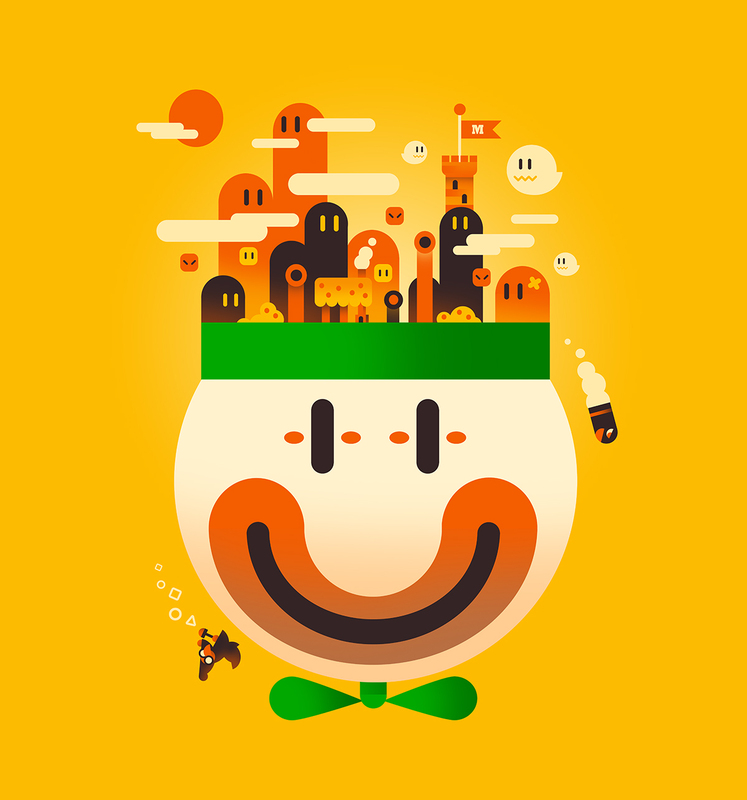 Scott Balmer, whose work has been part of shows and online as part of Gallery 1988, Fangamer and iam8bit has done a new piece, Super Mario World, inspired by the game and the games 25th Anniversary on Nov 21. Scott has been mentioned on our site frequently relating to video game art. We talked to Scott about the possibility of doing a piece for the anniversary and have been blown away by what he created. Below we asked him more about his connection to Mario and video games. To get the piece already framed get it here. TTDILA: So Scott, we've discussed it before, but what's inspired the piece? 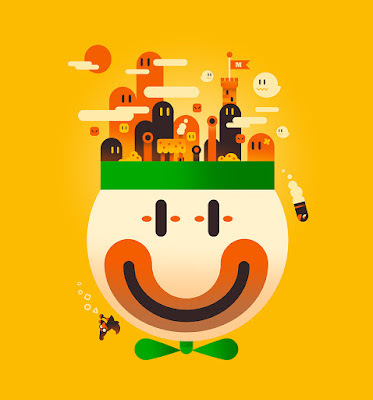 Scott Balmer: Looking at what feels memorable from Super Mario World, I think many would say that bowser’s clown car would be something that folk would remember since it was the first time that it was featured in a Mario game, plus the boss fight was a little different from what had come in the past. Another was the actual Japanese Box Art of the game which features Mario riding Yoshi in the middle of the world featuring many characters/objects from the Mario universe with it all siting on a yellow background to finish it off. I wanted to find a way to combine the two while paying homage to the 25th anniversary of the Super Famicom release. I like the lack of main characters, I can just get lost in the backgrounds, why is your piece minus Mario or any of the characters from the game other than some Boos, Magikoopa and a Bullet Bill? In some ways I wanted to focus on the ‘world’ aspect of the game, Mario and the rest of the main characters appear in pretty much everything so personally I thought it would be more refreshing to just concentrate on elements which could be seen as identifiable from not only Mario games but more importantly the super Mario world universe. Does the game hold anything special to you? I could write for days about the design, use of secret levels and just the ideas behind it. It does, but mostly from a childhood/growing up perspective since I used to play and beat this with friends throughout the years. I can’t remember how many times I have beatin it, including the GBA version. Though I do remember beating it for the first time, to begin with it was my friend who had the SNES before I got one. I think he got it roughly at launch... can’t remember when, but I can recall that it did eat at me inside that he had one and it looked highly likely that I wasn’t going to get one any time soon. But that isn’t the reason I remember this, no. We had gotten right to the end of the game, only Bowser stood in our way and that’s where the problem happened, we just couldn’t figure out how to beat him. We tried getting up to him, didn’t work, we tried jumping on the Mecha-Koopas that Bowser lobs out at you to try and reach him, nope still not working. We got through and asked the guy how to beat him to which he replied that he couldn’t tell us which is something I found hilarious. A helpline that can’t give out help. After a bit of pressing, he then agreed to give up a hint basically saying those things he throws at you can be thrown back at him, that was all we needed to hear and shortly after the call we had managed to beat the game for the first time. You've been playing Super Mario Maker, has that helped with the piece or given you some insight into the game? In some ways yes, it did. Much like other games that I’ve based my work on before sometimes there are things that you remember, what they look like, but want to make double sure that it was from that specific game and not a later title. With Mario Maker, I could check certain elements out before creating them in the piece, I did use it briefly to look more at the clown car though what I really used it to look at more properly was the magic shapes that Magikoopa shoots out, I knew it was circles, squares and triangles though I was also thinking crosses so it was handy for clearing that up. Another thing is that usually a Magikoopa shoots them out in a group whichIi initially arranged in that way but quickly changed the arrangement to more of a line simply because a similar arrangement is shown on the actually Super Famicom SMW box art. Super Mario World is my favorite game, what about you, and if not in the Super Mario series, which one in the series. I'll be blown away if it's a Mario Party game. It is one of the best Mario games though personally I’m in the camp of liking Mario 3 more, it’s true that SMW does a good few things better than Mario 3, what with its secret levels, the special world and joining it all together as one whole world map. Though Mario 3 to me, does offer a bit more variety in it’s levels and also far more power ups such as my favourite the frog suit. In the end, they are pretty close in terms to how I rate them, Super Mario World is not that far behind. The Closes Nintendo Mall Showcase? LA Film Festival @ ArcLight? Adventure Time Time: AT Is Back, Marcie's Mom?